Custom work is my specialty. For over 25 years I have been making fine jewelry pieces tailored specifically to my individual client’s vision. I find it is very satisfying to me to help my clients with their jewelry wardrobe. Whether it is repairing that special piece of jewelry no other jeweler will touch (or someone did and should not have); restoring an antique engagement ring that has worn through the design on one side (because the previous owner wore this ring frequently against another ring); or melting down pieces of old gold jewelry (broken chains, half of a pair of gold earrings, rings you never wear anymore, even dental gold) and creating a brand new piece of jewelry, I love the challenge of transforming jewelry that has become dysfunctional into jewelry that will be treasured! The possibilities are endless. Here are just a few of the many custom jewelry projects I have completed lately, that may inspire you to contact me. Perhaps you have purchased a loose gemstone on a cruise and want to have it set. A design from this web site could be a starting point for a creation just for you. Maybe you collect gemstones or cut gemstones and you want a piece of jewelry custom designed for one of your stones. You love one of my ring designs on the web site, but you want another type of gemstone in this design – such as, your birthstone. You are inspired to redesign your wedding and engagement rings, and you want to melt the gold and use all of the stones from the original setting in a new ring. Incorporating an actual portion of the old ring into the new ring is sometimes a goal of clients. Someone special in your life has died, and you want to combine some of their jewelry into a new piece of jewelry you will wear and remember them by. One side of a pair of special earrings is lost or damaged. A replacement could be created or if this is not possible, there may be other uses for the remaining earring – such as a pin or pendant. Finding earrings to wear with certain pieces of unique jewelry can be challenging. Often the best solution is to commission a pair of earrings that have a similar design voice. Custom made earrings also will be designed with the proper shape for your face and scale for your life style. 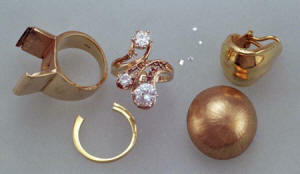 The artist in you has developed a design idea and now you need a goldsmith to create it. You want a mother’s ring that doesn’t look like a mother’s ring.